El Popo Staff has 140 articles published. It was the summer of August 1998, and I had just turned eight. I remember the cracked concrete sidewalks of Liverpool, and I remember the way the store clerk looked at me every time I said “Hola.” What I remember the most, however, were my mother’s words. “No vamos a comer hora. Juega con tus amigos,” she’d say to me, then hug me and let me go. I didn’t understand what she meant every time she’d say this. All I knew was that playing with friends was better than eating. We’re oblivious to a lot of things in our childhood, and I was no different. I never looked into my parent’s eyes and saw the hardships they faced. The year 1998 marked the twelve years my parents had been living in Liverpool. The opportunity that once shined in the sun was now a faded dream. Work dominated their life. The clothing factory they worked in was a building of hazards with security guards at every corner. “I worked with packaging and machinery. You’re mom sewed pants, jeans and blankets all day. Workers were separated by race. The Irish and Scottish in the first rows, Mexicans in the middle and blacks in the back row and so on…” recalls my father. According to my parents, work shifts were about 12 hours. If a person could not work those twelve hours, they would be fired. On some days, workers would be paid 3 pounds (about $5 in the United States) or they weren’t paid anything at all. Talking and going to the bathroom would be forbidden. Female workers had to take a pregnancy test, and if they tested positive, they would be fired on the spot. Every day the workers faced conditions that took a toll on their health. For them, it was a daily routine where they sacrificed their well-being in order to obtain the essentials—money, food, and clothing. Although all of them came from different countries, it was their shared experience that brought them together. 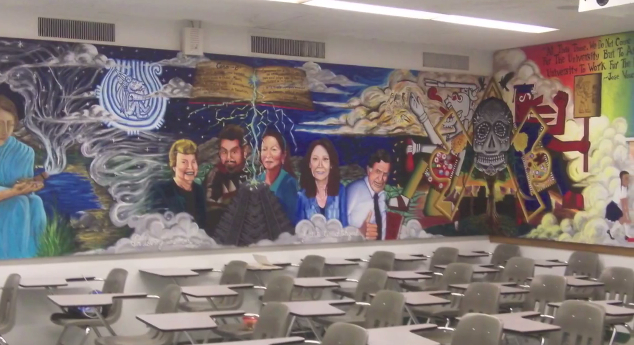 Students create a new mural depicting recent history.